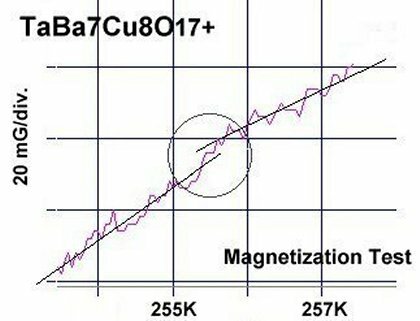 Superconductors.ORG herein reports a new high Tc (critical transition temperature) for copper-chain superconductors. 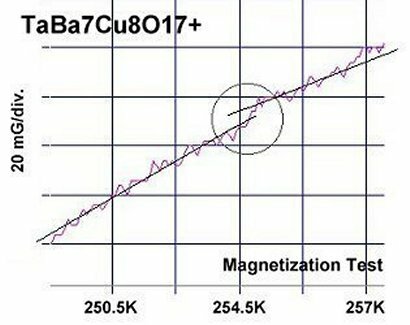 The compound TaBa7Cu8O17+ has produced a Tc near 255 Kelvin (-18C,-1F). This is believed to be the first high temperature superconductor to successfully incorporate tantalum. The B212C structure (where B=11) of Ta178 is depicted below left. It is a close analog of the 9223C structure of Y268 discovered in 2009. The plots at page top represent two of six unambiguous tests that displayed a Meissner transition near 255K. The straight lines drawn through the noise represent the average of the data points, skewing apart at Tc. As can be seen in the plots, the signal is only around 6-8 milliGauss in amplitude. This indicates a low volume fraction, likely due to the small ionic radius of tantalum. At 0.64Å tantalum is almost certainly occupying some of the 0.73Å copper atomic sites. Because of tantalum's preferred oxidation state of +5, a long chain of copper and barium atoms in the "Heavy" part of the structure is required to establish superconductivity. The above right graph shows how Tc should increase with higher planar weight ratios along the C2 (TaBa) axis. 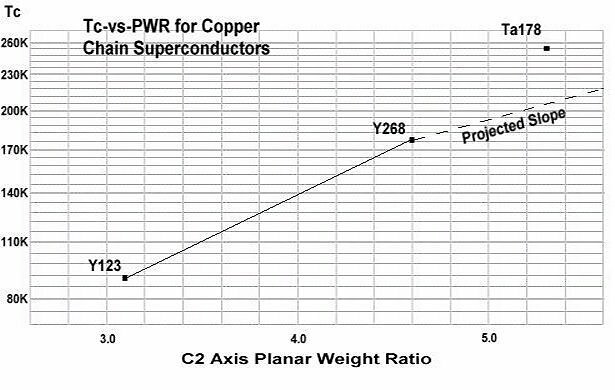 The projected slope was derived from the graphs of several dozen other high-temperature superconductors that were created through the application of planar weight disparity. The position of Ta178 on the graph is almost 50 degrees Kelvin higher than it should be. This is probably due to the high dielectric constant of TaCuO. Charge reservoirs in copper-oxide superconductors have long been theorized to be facilitators of the superconductivity process. Charge reservoirs are simply microcapacitors at the atomic level - oxygen sandwiched between conductive metals. As such, the dielectric constant of these microcapacitors determines how much charge can be stored. Tantalum-oxide has a dielectric constant of 25. And tantalum-copper-oxide has a dielectric constant over 100.1 So the improvement in storage capacity in this material is significant. This discovery also supports the theory that superconductivity in the layered cuprates originates in the oxygen layers - especially where the planar weight ratio is highest. Synthesis of TaBa7Cu8O17+ was by the solid state reaction method. Stoichiometric amounts of the below precursors were mixed, pelletized at 60,000 psi and then sintered for 10+ hours at 885C. The pellet was then annealed for another 10 hours at 500C in flowing O2.